Get to know your relatives and make the table talk fun with a conversation basket. Print and cut out the cards by clicking the “Download Here” link above. Fold them up and place them in a basket. Now take turns reaching in and answering the questions. 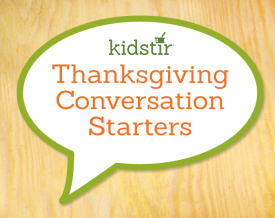 How about some fun Thanksgiving Recipe classics kids can help stir up, like Yams! Ingredients include sweet potatoes, roasted garlic cloves (optional), cream, butter, grated fresh Asiago or Parmesan cheese for a kids favorite side dish. Don’t miss our Thanksgiving Cooking Kit for Kids. It includes recipes for Zesty Cranberry Sauce, Popcorn Bread, Awesome Apple Stuffing. And this kit includes a kids apron and a Spoon it up cooking tool.